Pack a punch with freshly painted kitchen cabinets. This time-tested method of giving cabinets a clean look has been updated with newly developed paints that make your job easier. When you contrast the minimal cost of paint and materials to the incredibly high cost of new kitchen cabinets, painting your cabinets is a clear winner. Before launching head-first into this project, though, keep yourself in check by remembering that this project is more than a quick, one-day job. Every item in your kitchen cabinets must be removed and safely stored. Doors and drawers need to be removed. Every surface that you intend to paint requires thorough cleaning. Choose one of two directions when painting kitchen cabinets: using materials assembled individually or working with all-in-one surfacing kits made especially for cabinets. Cabinet painting kits include much, but not all, of the correct materials you need. Cabinet painting kits tend to be expensive, often more costly than the sum of their parts. One prominent brand, Cabinet Transformations from Rustoleum, is a multi-stage process that lets you paint not only wood cabinets but melamine and laminate cabinets, as well. Apply a deglosser, then wipe it off with a clean rag. Roll or brush on a bond coat, which acts as a type of primer and color base for the subsequent glaze. Apply the protective top coat. Lush black graces these painted kitchen cabinets. Black cabinets can be chic, modern, sleek, warm. Pick your descriptor and black just might fit the bill. That's because black is stylistically so flexible. But it does have one major downside: flaws are visible. Lifestyle blogger Tammy Ellington concurs: "It’s so unforgiving. It shows every flaw in the wood along with brush strokes and mishaps, but it’s also beautiful when done well." Tammy's secret to pulling off this project successfully is milk paint. It lays down perfectly and shows almost no brush marks. Tammy used General Finishes' Milk Paint in Lamp Black color. Is it possible to paint your kitchen cabinets without the added hassle of prior sanding and priming? For some homeowners, this cumbersome task is the sole obstacle that prevents them from charging ahead with the project at all. Tasha Agruso of the popular blog Designer Trapped in a Lawyer's Body decided to try painting without sanding and priming. Rather than brushing on paint and hoping for the best, Tasha entered the project with near-scientific precision. After some thought, she concluded that it is possible to paint your cabinets without sanding and priming, and how great is that? Tasha reports that the cabinet paint finish is still going strong even years after she first applied it. A cool, measured balance of classical elegance informs these painted kitchen cabinets. Williamsburg-based decorator Jennifer Hudson at the design blog Dear Lille Studio inherited these painted kitchen cabinets from the previous owner. Jenni believes that the color is Benjamin Moore Lampblack. Lampblack was a charcoal-tinged color traditionally found in 18th- and 19th-century wallpapers. Kitchen cabinet on the outside, chalkboard on the inside. This surprising touch is easy to do when you buy easy-to-apply chalkboard paint and roll it on the inside of your cabinet doors. Create a grocery shopping list or simply say "I love you" to any family member who happens to be the next person to open the door. Chalkboard paint is inexpensive and water-based, so it cleans up easily. 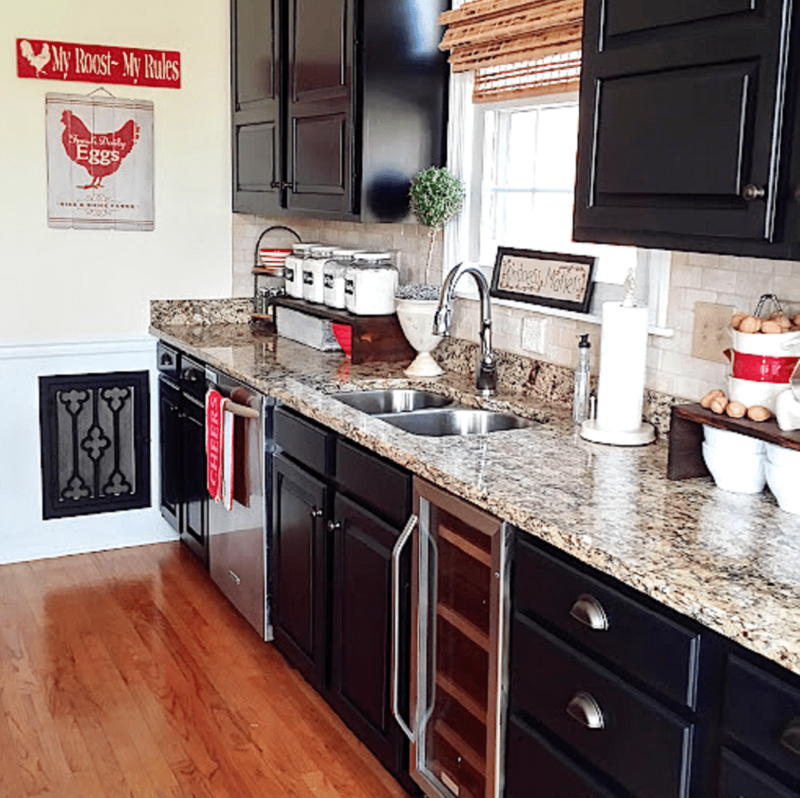 This kitchen is the creation of home improvement blogger Virginia Plunkett, whose hugely popular tutorial shows how to paint cabinets as painlessly as possible. Gleaming chrome pulls, new subway tile and a Kohler sink are the finishing touches to Diane Henkler's completely remodeled kitchen. And the centerpiece of that is her do-it-yourself painted kitchen cabinets. One word of advice from Diane: "Spring for high-quality paint." To that end, she chose Valspar Bonding/Sealing Primer followed by Sherwin-Williams ProClassic. For a high-visibility project like this, it is important to purchase higher-quality products that ensure long-lasting results. 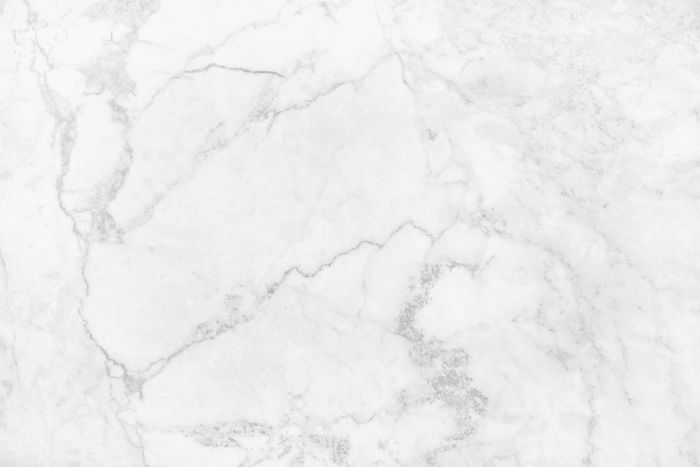 The star of this kitchen is not just the gorgeous creamy white color and smooth finish. The lack of investment in high priced spraying equipment makes these painted cabinets doubly great. Home design blogger Laura at The Turquoise Home, intent on having a fabulous kitchen without buying what she calls "fancy equipment," invested major labor and a lot of swearing, but says she would do it all again in a heartbeat. Because the choice of paint is important, she picked two winners: Ace Hardware’s Door, Trim and Cabinet Paint, along with Benjamin Moore’s Advance Paint. An upstate New York home built in the 1880s deserves special handling when it comes time to remodel. Abbey Hendrickson at the design blog Aesthetic Outburst knew that she wanted a classic and sedate mood for her farmhouse kitchen. Simply to rid the existing cabinets of their dark, depressing brown color, Abbey and her husband first sprayed all of them white. Then, they left the upper wall cabinets white but painted the lower base cabinets a rich, moody color, accented with Martha Stewart brand brass pulls. Dark kitchen cabinets plague many homeowners. But Christy's cabinets were so dismal that she calls them "dark, dark, and more dark." Exacerbating the problem were the black granite countertops. So, the first order of business was to apply two coats of primer, a necessary step since the cabinets were so dark. Cabinets remained white, while the kitchen island was painted a light-blue shade, Campfire Ash from Behr. Mother-of-pearl tile for the backsplash adds even more shimmer to this space. Not content to live with her oak cabinets and feeling positively "consumed by wood," Kassandra Dekoning took decisive measures and painted over the wood. Her plan of attack involved Zinsser Bulls Eye 123 Water-Based Primer and Benjamin Moore Advance Paint in Pearl Finish. The result is a sleek, sophisticated color scheme that bears no resemblance to the previous country style red oak. Best of all, she spent considerably less on the project than if she had replaced the cabinets. Aniko's kitchen went through a few transformations before arriving at its current gorgeous look. When Aniko first moved in, the kitchen cabinets were builder's grade red oak. After switching to Shaker-style cabinets, she still knew she wanted something different. Time for a two-toned cabinet style, both colors from Home Depot's house brand Behr. The top cabinets were sprayed in Behr's workhorse color for trim and casing, Ultra Pure White. The base cabinets received Behr Night Club, satin finish.